A Short Film about small towns in America. Ever wonder how your small town got its start? 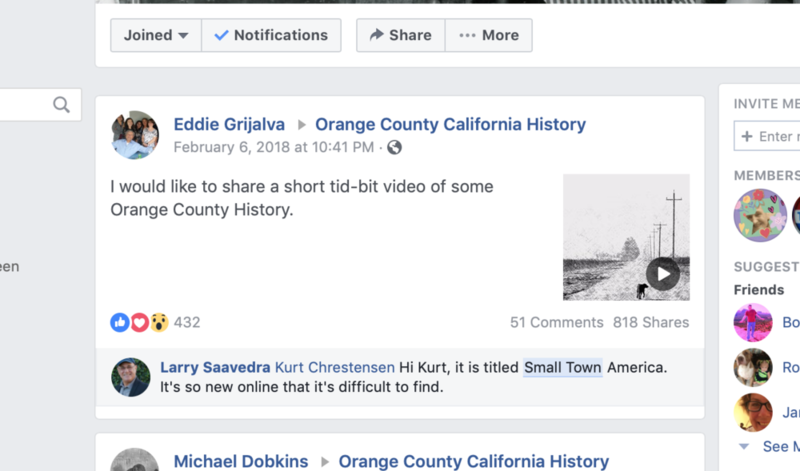 Born in 1933, Eddie Grijalva talks about the small town of El Toro in Southern California and how World War II and fast-paced development affected the once peaceful community. Getting caught up in commercialism isn’t very satisfying to the creative soul. Once in a while the creative mind needs an outlet that actually does some good for people you have never met. Working with non-profits is a whole lot different than working for a commercial business. First there is no pay. Secondly you will spend countless hours doing whatever is necessary even if you don’t entirely agree. But if you can wrap your mind around the fact that your creative skill set can make a difference in someone’s life then everything about the project begins to make sense. It did for me. Don’t look for thank you gifts, or pats on the back (well you might get that). Getting involved in a non-profit cause must be done as a personal mission of sorts with nothing expected in return for your service. I’ve been lucky to work directly with several non-profit organizations and all of them have been a great experience. Sometimes people in need don’t need a handout. What they need are creative skill sets. If you are thinking of working with a non-profit just do some research first, establish whether the cause is right for you and then go for it! The popularity of human interest stories is evident in the stats from this Facebook post about small towns. Everyone Counts happened in 2019 across America as a way to determine the extent of our homeless populations. The Point In Time is a biennial count of people experiencing homelessness on a given point in time during the last ten days in January. For more details visit https://www.everyonecountsoc.org. Supplies for those homeless in Orange County. Kyle MacFarland Foundation required a high-end video shoot and professional editing of the content to get the word about eating disorders. From that video a website was launched and the foundation continues to support those afflicted with eating disorders of all kinds.